Life has been tough for 8-year-old Tyler Hunt ever since he was diagnosed with leukemia in February. 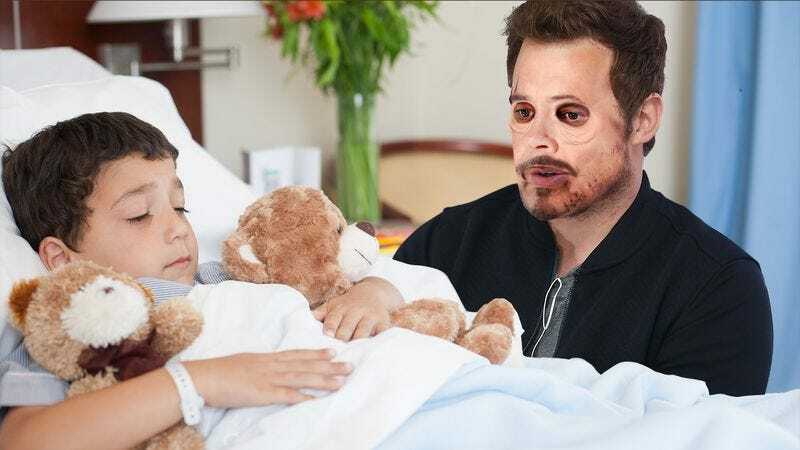 But when Chris Pratt found out that Tyler’s favorite superhero was Iron Man, he made the young fan’s day by doing something absolutely incredible: Yesterday he showed up at the hospital wearing Robert Downey Jr.’s skin! This guy just keeps getting more amazing! The Guardians Of The Galaxy star truly went above and beyond for Tyler, arriving in a full-body suit composed of large swaths of Robert Downey Jr.’s skin sewn together into the spitting image of Tony Stark himself. From the moment he walked in, Chris Pratt was committed to making it a day Tyler would never forget. Whether it was reciting iconic lines from Iron Man or letting him try on Robert Downey Jr.’s face skin for a while, the sweetest guy in Hollywood spared no detail to give this kid the true Iron Man experience. Wow, what an awesome thing to do for a fan! Chris Pratt just proved that no gesture is too large for a kid in need. Way to go!